Captain Morgan's Rum Do | Original songs about the golden age of piracy! Look for us on the Soapbox Stage, in the woods, at dead of night on Sunday 19th August. 10 pm start! 7/9 Northview Drive, Westcliff-on-Sea, SS0 9NG. Pillaging starts at around 7.30 pm. 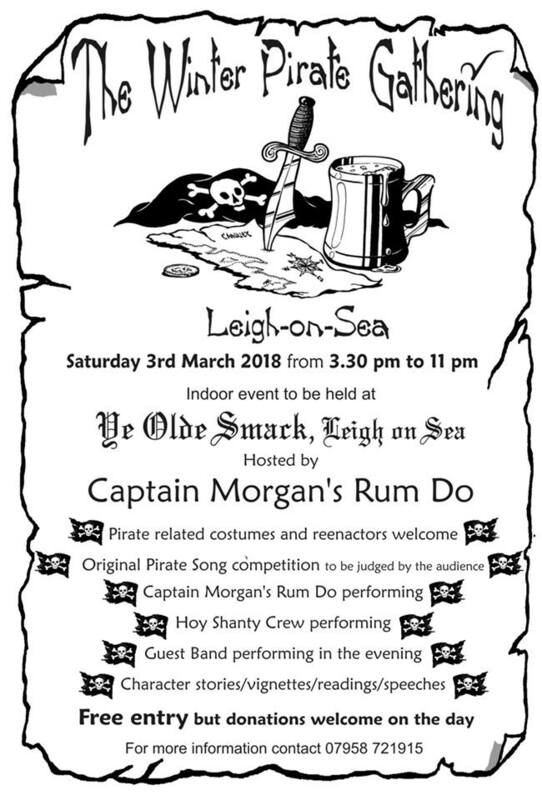 Brixham Pirate Festival 2018 will soon be upon us! After a weekend on the grog we will be playing on the Main Stage at 11 am on Monday 7th May. We will be commencing our weekend of pirate fun and debauchery at The Old Coaching Inn, 61 Fore Street, on the evening of Friday 4th May. Come and see us for real songs about real pirates! From 8.30 pm onwards. As this is in aid of Leigh Folk Festival, which is a very good cause indeed, please try to drop in and see us! We had a great day at the Smack! Unfortunately, The Captain’s Beard were stranded in snowy Sussex and couldn’t make it, but local band Grand Reunion stood in at the very last moment. Not that they made it without mishap, as they were without their guitarist, who was, at that very moment, waiting for the paramedics after having a bad fall while loading his kit. A depleted Tempus Experientia, in the shape of “Sailor Sam” (Kevin Corcoran), provided the links and the Hoy Shanty Crew sang their hearts out for us. Nigel Townend won the songwriting competition. The Cap’n is a hard-hearted blackguard and insisted that entrants had to be there in person and perform their entry themselves – and Nigel did exactly that. Rash. Impetuous. Foolhardy. Bold. 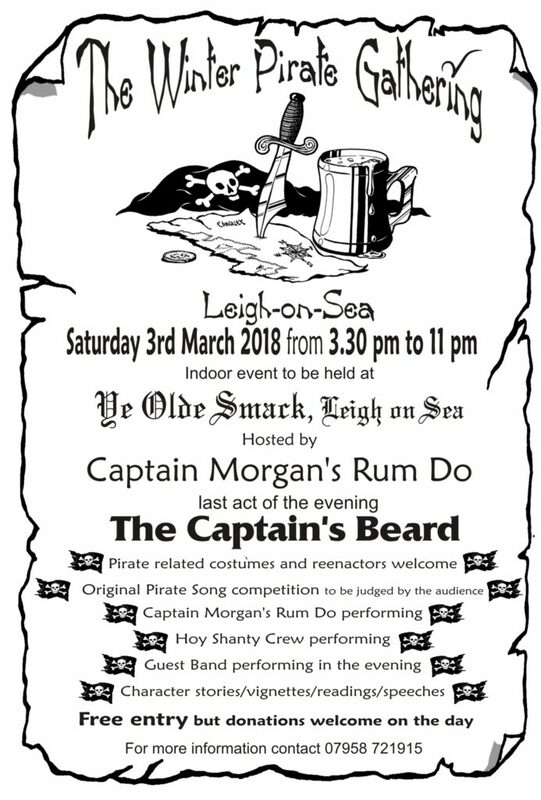 Whetever you call it the Winter Pirate Gathering at Leigh on Sea is going ahead tomorrow after all. We have a band, The Captain’s Beard, braving the great outdoors to come up from Brighton, we have our own crew, Captain Morgan’s Rum Do, battling their way from Ipswich and Felixstowe and Tempus Experientia fighting the trains to come from the other side of London. The Hoy Shanty Crew are hardy folks and they plan to be there as billed. All we need now is an audience to make it all worthwhile…. come and spend the day in a pub – what else will you do? Join Captain Morgan’s Rum Do for the Winter Pirate Gathering at Leigh on Sea – you know you want to be there! You’ve written your new Pirate song, haven’t you? You’re looking forward to seeing the Tempus Experientia performers, aren’t you? You’re longing to hear The Captain’s Beard, aren’t you? And you wouldn’t want to be anywhere else next Saturday, would you? Write and perform your own pirate song (there will be prizes) … go on, you know you want to! We are still negotiating terms with our guest band – these pirates drive a hard bargain! Eventful month, during which the ever-beloved Mother Cutbeard, ship’s maid-of-all work, has required the services of the best barber-surgeon that money could buy. Clearly, he weren’t much good – even after being sobered up – so she has for the time being lost the use of her strong right arm. The crew think she brought it upon herself by her policy of not carrying her cutlass on a Sunday, the day of the week when this lamentable tragedy occurred. Good news is, she is still as lethal with her left as her right, and will soon be back on board! Details of 2017 sailings to follow!